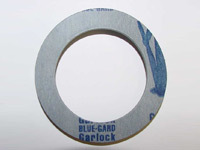 Garlock BLUE-GARD 3400 Aramid fibers with an SBR binder. A compressed non-asbestos gasket sheet of aramid fibers and high-temperature fillers with an SBR binder. Often used in low-pressure saturated steam applications.